I’ve had some of my overseas friends ask about the rise of Donald Trump. “Has America gone mad?”, is the most often asked question I’ve heard lately so I thought I would devote yet anther blog post to this train wreck of a human. I have a confession to make. About 10 years ago I was addicted to infomercials, which led to a mild form of OCD that lasted several years. Apparently if I hear the phrase, “This (fill in the blank) is a must for keeping your house clean” I have to have (fill in the blank). Thanks to this addiction I own three vacuum cleaners, a steam cleaner (I love this gadget), all sorts of cleaning agents, and two mops. I cannot blame guests who mistakenly think I own a cleaning service. My infomercial induced OCD would, at times, override my common sense. Once, right before a date, I was on my hands and knees using my steam cleaner on the bathroom floor because I found two strands of hair on the floor. Thankfully my date didn’t run out the door when he found me wiping the floor, but he did have a hard time using my bathroom after that. Looking back, I don’t blame him. I must have looked insane as I tried to explain why I wasn’t ready to go out yet. “Two hairs, two, damn it”. Out damn hair, out! Effective marketing establishes a need and tricks the viewer into thinking this is his or her need. This (fill in the blank) is the very thing you need. Consumers, research has shown, will respond to positive messages/words if they hear them over and over again. Once convinced they have a problem, they will easily hand over money for the solution, especially if they think they are getting a good deal. This is why the old, “wait, there’s more” or, “We’ll throw in (fill in the blank)” catch phrases are so effective in selling crap. Viewers not only want their problems solved, they want to think they are getting one over on the company. Does your family’s safety concern you? Does (fill in the blank worry) keep you up at night? These types of questions rely on the viewers’ susceptibility to such questions. Once we humans are alerted to a possible danger our emotional responses replace our rational thought. It is through the manipulation of our emotions that allow infomercial companies to rake in billions of dollars each year, even though most of the stuff they sell is crap. I was once fooled into buying an “innovated cleaning cloth” that allowed colored clothes to be washed with whites. The cloth was marketed to “capture” bleeding colors so that the whites would remain white. No, no it didn’t. All it did was tie dye my then husband’s white T-shirts. He was not amused and I felt like a complete fool. In short, infomercials prey on consumer’s vulnerabilities and insecurities by introducing a manufactured problem and cheaply designed solution. They are successful because they know what words to use and how to use them. They have years of marketing research that assists them to gain our trust and our loyalty. But underneath they are nothing but snake oil salesmen out to make a buck; not at all interested in giving the consumer something work paying for. So what does this have to do with Donald Trump? I think you know where this is going.. It occurred to me last night, as I watched in horror and fascination, Trump’s “press conference, in which he displayed many Trump products, that he is nothing more than a human infomercial. I tweeted this idea tout because it answered the question, “Has America gone mad?” No my friends, America has not gone mad, but some of us have sadly bought into this sleek but slimy infomercial. Trump, who is a master salesman, has taken many of the same principles found in infomercial marketing and made them his own. He is preying on our fears and has not only outlined a manufactured problem, America is in trouble” he has come up with a cheap solution, “Let’s make America great again” and has spend months selling a story that backs up his claims. Those who follow him have allowed their emotional response to override their rational thought process. They are so scared that America is not great anymore that they forget that Trump, in all his years in business, has never done anything for America. He has always been in it for himself. This quest to be our national leader is nothing more than a bid to be even more powerful; it’s a “personal best” goal. Nothing this man has ever done has been for the greater good, yet thanks to his infomercial like campaign, people are lining up to get a good deal. But a good deal he is not. It’s time to turn off the human infomercial and realize that though we may have real problems, this cheap suite, this snake oil, is not the solution. He is nothing more than a product, as seen on TV. Consumer Reports Should you buy this now? I’m sure anyone who has been enjoying Lynn Shepherd’s Charles Maddox series will agree that with each book her skills as a writer become stronger and stronger. The “Pierced Heart” is her best effort to date. Not only is Shepherd coming into her own as a writer, her twist on Dracula is a fast paced, engaging ride. I read it in one sitting. Charles, our reluctant hero, visits the estate of an Austrian nobleman on behalf of Oxford. Charles is asked to determine the man’s character after the Austrian offers a substantial donation to the University. Once there, Charles quickly finds the man is not all that he seems. There are some serious questions to be answered. Is he a truly a nobleman who has the means and time to devote to natural philosophy or is he a mad scientist? As the story moves from Austria to the streets of London, Charles is compelled to find the answers. Shepherd follows the original Dracula plot to a point; it is here where her imagination shines. Just when we readers think we know where she is going, the story takes a decided turn. There are just enough twists to keep readers guessing while retaining the original unsettling mood. Shepherd doesn’t just give us a twist on the vampire story; she offers comment on Victorian values and how they affected women. Not only were they victims of violent times, they were at the mercy of the misogynist attitude towards them. Women were denied voices, no matter how loudly they screamed out in the night. My only complaint is the inconsistency in the narration. I would have liked it if Shepherd had kept to one style. The abrupt change pulled me out of the story. But once the initial shock was over, I was quickly pulled back in. 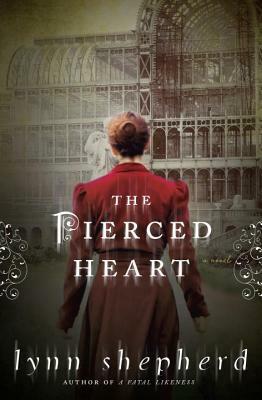 With “The Pierced Heart” we finally have a three-dimensional character in Charles. Readers learn more about his back-story and two secrets are revealed. Though one is something Charles seems to be hiding from himself. The novel ends with a twist for our hero. There is yet another question to be answered. I can only hope Shepherd shares this answer with her readers very soon. I’d like to thank Librarything for the opportunity to read this book.